The Fellowship was fortunate enough to obtain a copy of BLACK SCIENCE #1 from Image Comics. Rick Remender writes, Matteo Scalera draws and Dean White colors. Grant is what you might call a rogue scientist; he’s got some ideas that many people don’t take seriously. “Black science,” they call it, and it takes an anarchist to practice it. Grant has built a dimension-hopping device and taken a group of his people to explore the other side. But now the device is damaged and he doesn’t know if he can get home. In this first issue Remender does a delightful job of showing us who Grant is. His internal narration explains his every move through this exciting footchase of a story, telling us how he got there and walking through his every decision. We learn a lot, including that he may not be the most likable guy in the world, but he takes his responsibilities seriously. And the art is simply amazing; Scalera and White build aliens and alien landscapes that look and feel so natural, it’s scary. This is a great beginning to a very promising title, especially if you’re into weird science and multiverse hopping. But even if you’re not, there’s a cool story in here as well. Totally check this book out. 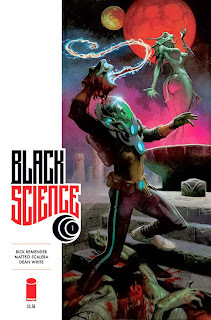 BLACK SCIENCE #1 is available now at your FLCS and online at imagecomics.com.